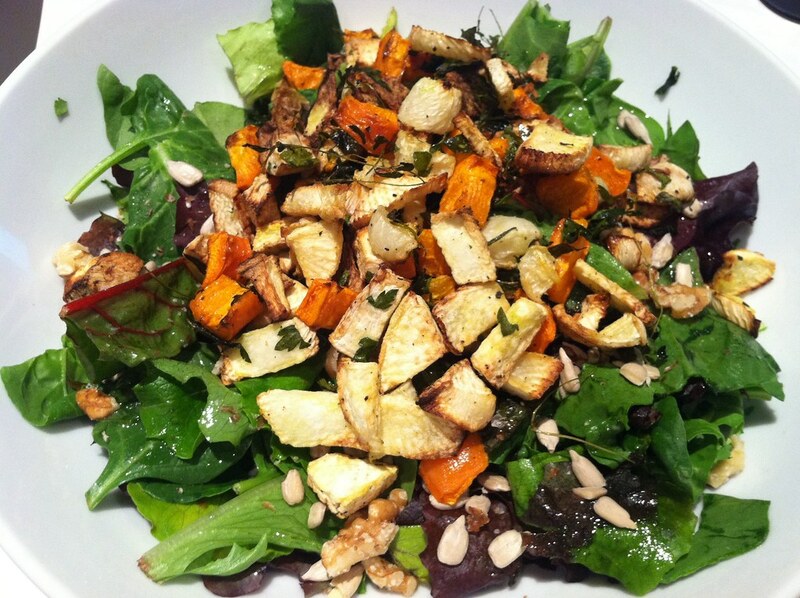 healthy inspiration – CSA salad! – ugly food tastes better. Just a little showcase spot for my CSA goodies. This time of year I start craving salads again (thank god) but while its still not too hot to enjoy roasted veggies, I made a combo salad! My tarragon needed harvesting, and I had the CSA parsley as well as some leftover rosemary and thyme to use, so I chopped all those babies up and tossed them and a little olive oil with diced CSA carrots, daikon, and turnips, ground some pepper and truffle salt on top and put them in the oven to roast for 45 minutes. When they were almost ready, I tossed some baby spinach and spring lettuce mix with the juice of half a lemon and a splash of grapefruit balsamic, and topped with a handful of sunflower seeds and some crushed walnuts. Divinity! WOW! This looks like a delicious and filling meal. Love the idea of roasting the veggies first. A great way to spruce up and old favorite. Done! Thank you! I am loving your link parties!